If you walk from the first district across the Donaukanal canal to the second district, maybe to get to the Karmeliterkirche Church and market, you will pass an elaborately decorated building: The Produktenbörse. This is the Austrian (or Viennese) version of a corn exchange building - similarly to most British corn exchanges, which you find in many major cities, the Produktenbörse is not used for the sale of agricultural goods anymore. Until 1812, there was a law against trading with cereals such as barley, corn or other agricultural goods. Crops had to be sold by the farmers directly to the consumers, usually via markets that were tightly regulated and under control of the local landlords. Then Emperor Franz I abolished this ban in 1812 and within a short amount of time, trading wheat, corn and alike became a lucrative business in the Austrian Empire. In 1853, a trade association formed. The "Wiener Frucht- und Mehlbörse" or "Vienna fruit and flour exchange". It was under direct control of the city of Vienna until 1869, when the economic craze of the Gründerzeit provided the economy with enough confidence to demand more freedom for the exchange of goods. An independent exchange for agricultural goods was the result of this demand and in 1887, the responsible trade association started to construct its own building - the Produktenbörse. It was designed by the historicist architect Karl König and the building was completed in 1890. It is in the style of neo-Renaissance and full of Italian-like ornaments, making the building about as authentic and attractive as a Las Vegas casino. The temple-like Produktenbörse was used throughout WWI and the time until the Anschluss, despite of economically difficult years. In the "Battle for Vienna", the second district was one of the final bastions for the Wehrmacht and the Soviet army shot most buildings near the Donaukanal into rubble. The Produktenbörse was severely damaged, too and the central trade hall burnt down. Soon after the end of the war, the building was fixed, refurbished and re-opened in 1949. The central trading hall, however, was not used for trading activities anymore, but only occasionally for special events. It is outlaid like an antique forum or the inside of a Roman assembly hall. Only in the 1980ies, a theatre group started to use the trading hall on a regular basis for theatre performances. 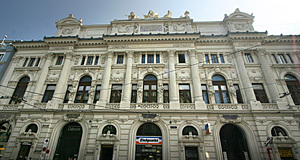 Today, the Produktenbörse is fairly well-known in Vienna as the "Odeon", a theatre and concert venue. Attractions nearby include the Karmeliterkirche Church and market, the Jewish quarter and the sights of the first district.